What are the Benefits of Having an Artificial Grass Lawn? Home/blog/What are the Benefits of Having an Artificial Grass Lawn? Are you tired of spending half of your summer mowing, watering, and fertilizing your lawn just to try to maintain the attractive appearance and keep the weeds at bay? When you’re a homeowner, it can often feel like you spend more time taking care of your home and property than you do actually enjoying it. If you’re fed up with working tirelessly to keep your lawn neat and tidy just so the neighbors don’t judge you, an artificial grass lawn may be the answer to all of your problems. To help make the decision easier for you, we’re going to break down exactly what an artificial grass lawn is and how you can benefit from investing in one. What Is an Artificial Grass Lawn? To put it simply, an artificial grass lawn is one made from artificial, or synthetic grass. Synthetic grass has been around since the 1960’s, but the first major installation took place at the Moses Brown School in Providence, Rhode Island in 1964. The product installed was a very early version of synthetic grass called Chemgrass. Today, third generation synthetic grass is made from white and green polypropylene plastic pellets. Under the synthetic grass is a thatch layer which provides support. Synthetic grass then goes into a tufting machine (which is essentially a giant sewing machine featuring hundreds of needles) that gives the grass its blades and reinforces the thatch. The tufting machine gives each part of the synthetic grass more durability and a longer lifespan, making it an essential component in the manufacturing process. While synthetic grass got its start on athletic fields, it’s now used for many different purposes, including the artificial grass lawn, and has come a long way since its original inception. Apart from simply making it easier to maintain the lawn on your property, artificial grass has many other benefits. Let’s take a look at them in more depth below. When it comes to the grass vs turf debate, the biggest pro for the fake grass lawn is that there is absolutely no water or other maintenance needed. You won’t have to worry about mowing your lawn every week to keep it at a nice length. You also won’t have to worry about watering it regularly to keep it looking lush and green. And when fall comes around and the leaves pile up, you can just sweep them off and be done with it. Instead of wasting half of your summer worrying about maintaining your lawn, you’re now free to focus on just enjoying it instead! In the winter, lawns made from natural grass or sod will become dormant and, as a result, turn brown. This isn’t ideal, as having a brown lawn isn’t typically viewed as attractive. If you live in a drought-heavy area, your lawn will turn brown too, because it’s not getting the water it needs. And, sadly, when you have a natural grass or sod lawn, both of these occurrences are unavoidable. An artificial grass lawn, on the other hand, will look lush and green no matter what time of year it is or if you’re in the midst of a drought. Because you don’t need to water an artificial grass lawn, you can conserve water without even trying. With landscape irrigation accounting for much of the residential water use, conserving water in this area is a great way to give back to the environment. In addition, some artificial grass products are made from recycled materials, which keeps them out of landfills – so it’s a win-win for you and the planet. In terms of durability and longevity, artificial grass lawns have natural lawns beat. With an artificial grass lawn, you don’t have to worry about it getting beat up, because it’s built from material that’s literally made to withstand roughhousing. Want to have a game of football, capture the flag, or another tough sport on your property without having to worry about the state of your lawn after the fact? Go with an artificial grass like Bermuda or Bermuda Pro. And, according to many distributors, artificial grass has a lifespan of 15-20 years, so it provides the ultimate in durability. 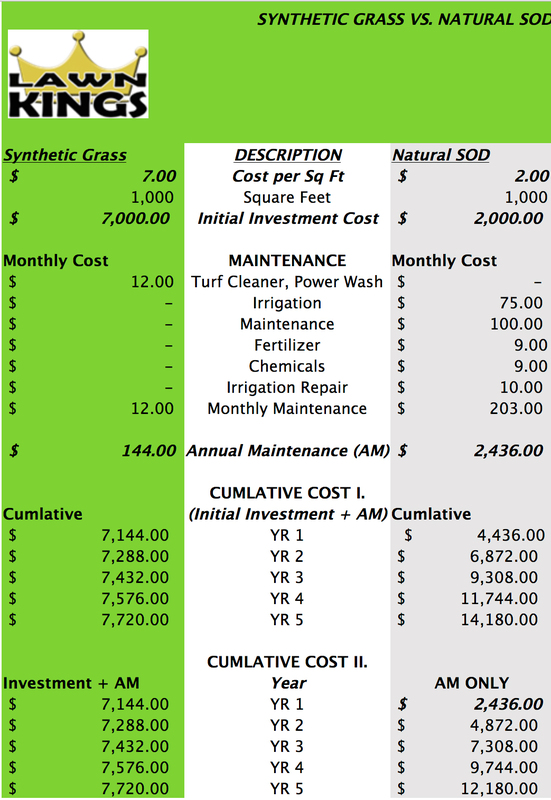 At the output, you may think that an artificial grass lawn is a big investment. It sure can seem like it. But when you think about it, going artificial can save you some serious cash. How? For one, you don’t need to spend money each season on fertilizers, sprays, or any other products you might use to keep your lawn looking clean and green. You’ll also save on your water bill because you won’t have to irrigate your lawn anymore. And no more broken sprinklers to replace. Yay! Finally, you’ll save valuable time because you no longer need to mow every week. And you know what they say, time is money. How great will it feel when the weekend rolls around and you don’t have to waste another Saturday or Sunday morning mowing the lawn? Instead, you’ll have more time to spend on the things you love with your friends and family. And if you ask us, having more time to spend with loved ones is the greatest gift you can ask for. With all of these great benefits, why wait any longer to invest in an awesome artificial grass lawn? Whether you’re looking for artificial grass for your home or a commercial property like a golf course or movie production set, Lawn Kings has the artificial grass solution for you. Contact us today with any questions or for more information about our products. We install artificial and synthetic grass for all of Southern California, including Los Angeles, the San Fernando, Santa Clarita, Antelope and Simi Valleys and more. See our most recent project areas on our showcase page. 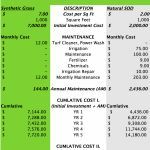 See the numbers and you’ll see why synthetic is a huge cost-saver! No more watering, no more maintenance, no more heavy fees!